Malwarebytes: Remove Malware from you system! 1. 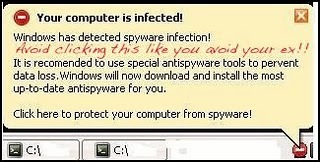 You will need to install AntiMalware software. Please click here to download MalwareBytes.org AntiMalware, a free download. 2. When the installation begins, keep following the prompts in order to continue with the installation process. Do not make any changes to default settings and when the program has finished installing, make sure you leave both the Update Malwarebytes’ Anti-Malware and Launch Malwarebytes’ Anti-Malware checked. Then click on the Finish button. 3. The software will now automatically start and you will see a message stating that you should update the program before performing a scan. 4. On the Scanner tab, make sure the the Perform quick scan option is selected and then click on the Scan button to start scanning your computer for Antivirus XP 2008 related files. 5. The software will now start scanning your computer for malware. This process can take quite a while, so we suggest you go and do something else and periodically check on the status of the scan. 6. A screen displaying all the malware that the program found will be shown. Now click on the Remove Selected button to remove all the listed malware. The software will now delete all of the files and registry keys associated with the Malware! You are now clean!